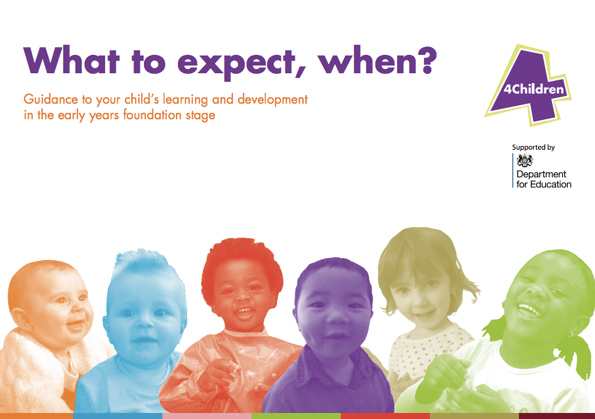 4ChildrenUK has produced a 35-page guide to help parents learn about their child’s development during their first five years, in relation to the Early Years Foundation Stage Framework (EYFS) established by the United Kingdom Education Department. The EYFS sets out 0 – 5 yr old learning and development stages. The guide is divided into six overlapping age bands, recognizing that “every child is different and children do not grow and develop at the same rate”. The booklet is for parents to use as a reference, also prompting parents and children to explore and try new things together. Parents were actively involved in assisting with the booklet development. What do you notice in your baby’s early growing? What do you notice as your baby starts rolling, touching things and playing with toys? Your child might be going to a nursery or childminder. Discuss what you are noticing with them. Focus more on the prime areas of learning. What do you notice about your child as they start becoming more self confident and aware, and managing their feelings and behaviour? Focus on the prime areas of learning and give more attention to the specific areas. What do you notice about your child as they grow in confidence? Focus on the prime and specific areas of learning. In this age band we list early learning goals that set out the expectation for where children may have reached at the end of reception year at school (state schooling in the UK now starts at age 4). The guide is written in the voice of the child speaking to the parent or caregiver (e.g. “I like you to sing songs and rhymes and read stories to me.”) At each stage, there is a list of skills to notice, along with suggested ways for parents and caregivers to assist the child with their learning. There is an additional section on Early Learning Goals (ELGs) for 5 year olds. ELGs outline the level of learning and development that children are expected to have reached by the end of the reception year in the UK school system that starts at age 4. Download the guide here, courtesy of Foundation Years.